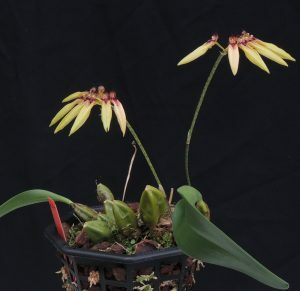 This is one of our favourite Bulbophyllum species as plants are vigorous and free flowering. For us the species tends to flower twice a year in the winter and again in late spring which more than makes up for the flowers only lasting two weeks in peak condition. We grow plants in baskets in shade in our Warm Asia section and water throughout the year. 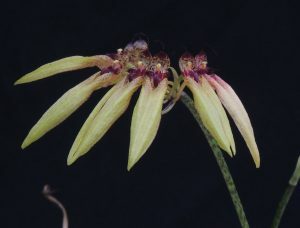 Bulbophyllum picturatum is native to lowland forest in Thailand and Myanmar where it grows as an epiphyte in evergreen trees. The intricate flowers are produces in a terminal semicircular circular umbel like group. This habit is common in a large group of Bulbophyllums once called cirrhopetalums. The large creamy yellow tube at the bottom of the flower is formed from the lateral sepals. The flowers are fragrant and have a fishy smell which is not unpleasant.